Benevilla is dedicated to fostering an understanding between creativity and quality of life for older adults. Benevilla knows that art programs help people to become more socially engaged, enjoy better health, and find greater happiness. Our Creative Aging program provides opportunities for local artists and local community members to collaborate. These programs are led by professional artists, art educators, and talented volunteers of all ages. Creative Aging partners include WHAM, West Valley Arts Council, Vanguard, Theater Works of Peoria, and Rio Salado Lifelong Learning Center. To learn more about these programs, contact the Marketing Department at 623-584-4999. Benevilla is a member of the National Center for Creative Aging. For more information on the NCCA, click here. Birt’s Bistro also serves as a bookstore for every customer looking for a new read. All books are donated by the community and sold at the affordable price of only $1. All proceeds are donated back to Benevilla to help fun the many Benevilla programs and services providing care and support for older adults, disabled adults, children and families within our community. The Birt’s Bistro Boutique is stocked full of beautiful pieces of art, jewelry, accessories and more from local artists. Frequently replenished, the Boutique is the perfect place to shop for unique gifts after a delicious meal at Birt’s. All sales made at the boutique directly effect the success of the Benevilla organization and mission. TimeSlips opens storytelling activities up to everyone by replacing the pressure to remember with the freedom to imagine. Benevilla Life Enrichment Program team members have been certified in TimeSlips and are excited to add this to the life-enriching activities in each program. Thank you to the following organizations for supporting this project. Friends for health – Friends for life! Pet therapy is a guided interaction between an individual and a trained animal. It also involves positive interactions with the animal’s handler. 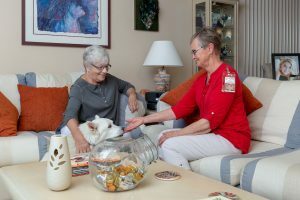 The purpose of BenePet therapy is to help our members gain the documented therapeutic benefits associated with pet therapy, while creating an even more home like atmosphere in our Life Enrichment Programs. Pet therapy builds on the pre-existing human-animal bond. Thanks to this natural relationship, pet therapy can aid progress toward goals in human physical, social, emotional, and cognitive function (American Veterinary Medical Association, 2013). Dogs and cats are the animals most commonly used in pet therapy. However fish, guinea pigs, horses, and other animals that meet screening criteria can be used. For some members, contact with the BenePet teams evokes memories of pets in their lives, past or present. The benefits of pet companionship include lowered blood pressure, diminished overall physical pain, decreased loneliness, and improved interactions with others. Pets also help calm those suffering from a dementia disorder. BenePet therapists say they get as much joy from the experience as our members. If you have an interest in becoming a pet therapy team with your pet, please fill out our BenePets Behavior-Temperament Questionnaire.